Amy Cameron, kicking off the NEW YEAR with a strong win at the San Bruno Hill Climb. Hanna Muegge amid the men. Still sporting the Don Chapin MBRT kit, but the TMBW kits are on their way! “This is stupid,” I thought as I drove north on Highway 101 toward Cloverdale. My car’s dashboard displayed a giant “X” through the words, “Eye Sight,” and my car, which had been cruise-controlling along at 65 mph started coasting slower and slower until I pressed my foot back to the gas pedal. If my car couldn’t “see” the freeway lanes or the cars in front of me, what business did I have riding my bike in this stormy weather? Miraculously, once I hit Highway 128, the rain lightened up, sun rays broke through, and I, literally, drove through rainbows. It was chilly but dry at packet pick-up in Boonville, CA. My teammates (Amy, Meredith, Shelagh, Liz, and Mei) and I greeted each other between shivers, signing waivers, and fixing race numbers to our bikes. I swapped rain boots for cycling shoes with wool socks, toe warmers, and rain booties; I stuffed my pockets with extra gloves, hand warmers, and all the nutrition I’d need for the day; and chose to wear my rain jacket from the get-go, knowing that the tradeoff for being a little warm on the first climb would pay off once the rain resumed. Then, I learned the start was pushed back 45 minutes in order to allow the snow on the top of our first climb to melt. Rumor had it, Bike Monkey had people up there driving cars back and forth to expedite the melting process. I noodled around on my bike, in a few extra jackets, warming up or trying to keep warm with a few friends, while others chose to stay toasty inside their cars. I bet those seat heaters felt nice. Eventually, it was time to stage. At the start line, we listened to a brief pre-race talk. It was going to rain, all day, but especially hard around 1:00 pm when a thunder cell was due to come through; we’d probably be in Point Arena on the coast then or descending the 16% grade to get there. Oh, and the sharp rocks of Fish Rock Road were extra-exposed in these rainy conditions. I looked around at the many familiar faces of cyclists around me, wondering, if they, too, were thinking, “Are we crazy? We’re not really going to race this, are we? Let’s all get back safely, ok?” The countdown came; and, apprehensively, I clipped in and started pedaling. Course profile: 71 miles, 9600’ total elevation gain. I think of it in five sections:  the series of steep westbound climbs, which kick off with a 13% grade wall a quarter mile after the start,  the screaming 16% grade descent down to the coast,  the “flat” section in which we actually gain 2000’ while racing southbound on Highway 1 to Point Arena and up a never-ending approach to the mid-race aid station at the base of Fish Rock Road,  the race’s namesake, Fish Rock Road, which heads back east for 23 miles and is infamous for its first 15 miles of dirt with 10% average grade climbs and a chunky and loose descent before the road turns into broken pavement, and  8 miles of paved rollers on Highway 128 that lead to the finish line back in Boonville. My race plan: Don’t go too hard on the first climb, find a group along the Highway 1, don’t let up too much on the Fish Rock climb, don’t take risks on the loose dirt Fish Rock descent, and keep it steady and strong to the end. From the gun, people are vying for position, I care less about holding mine than usual, as the road is wet and I know we are about to hit that first hill. I settle into a comfortable climbing rhythm in the first section, leapfrogging with a handful of guys, as the grade changes cater better or worse to our strong suits. Amity is ahead of me; Pia, teammate Amy, and Kristen pass me; I tell them to have fun. It starts raining, it keeps raining, it rains harder. It’s chilly, there is snow on the sides of the road, there is snow on the road, it is really cold, Amy turns around, it rains more, it’s freezing. Men assume women descend slowly so get in front of me but let gaps open in front of them; I wait until it’s safe, then, go around them and catch back on. We’re on Highway 1 and it’s windy, really windy, and really really windy; a couple guys and I take turns pulling; we’re not not going that hard, but we’re moving, and it’s nice to be with people. It gets colder, it hails, it dumps. My group catches Kristen, she joins us but stops at the midway aid station. I continue on, certain she will pass me again on the Fish Rock climb. I come up on my buddies James and Renard; James follows me and we ride the rest of the course together. We don’t see Renard again but it’s so cold we can’t afford to stop, and two hypothermic people is not better than one. Save a few slippery clay patches, the dirt quality is actually better than in dry years when it’s hard to keep traction because of fine, loose dirt. It’s pouring, we’re climbing higher, it gets even colder, it’s ridiculous. I do finger exercises to keep my blood flowing, I pedal while braking on descents and tell James it’s the only day ever that I don’t want his draft. There is still no sign of Kristen. I cross the finish line and take 3rd place for women. I roll into the parking lot, confused. Where were all the cars? There were not that many people ahead of me. And, then, I realized, it was was a race of attrition. So many people got too cold to shift effectively or brake safely and called it quits either riding back after the first climb or SAG’ing in from an aid station. I learned 39 women had registered, 24 started, and only 14 (including teammate Mei) finished; these ratios were similar for men too. It was not easy for anyone out there, and I’m glad everyone made smart decisions to end the day safely. I commend Bike Monkey for their efforts to mitigate danger in the extreme weather conditions and help those who got unlucky out on the course. Back at Anderson Valley Brewing Co., we were greeted with delicious paella, podiums, the indoors, beer, and survivor stories galore. The atmosphere was one of camaraderie and accomplishment. It was a day we’ll all remember. I didn't plan on doing Wente. 10 hours in the car returning from Utah on Friday and Cat's Hill Saturday weren't optimal prep, but when the new Mr. Cameron Mitchell (just changed his name there, sneaky huh?) said he wanted to race, I felt I had to be supportive. And how convenient, his race started just minutes after mine and we'd only have to get up at 5am to make it. Sadly, the women's P12 field has shrunk to a tiny version of its once mighty self, so there we were, just 6 of us lined up to take the start at this awesome NorCal classic. Marissa had Ivy and Christina joining her, making it a trio from JLVelo. Tanya was doing some training for her World's qualifier so she was there for Thirsty Bear. And then Brooke Danaher was a new face, having recently moved back to the Central Valley from Seattle. We rolled out along the flat start and already the wind was ripping. With such a small group, there wasn't going to be anywhere to hide. Plus it was cold...in Livermore! We rode tempo the first time over the climb and immediately reduced the group to 3: Tanya, Brooke and me. Two more laps riding around in the wind and I did a little attack after the hard left that leads to the Bump climb. You know the one where you have to slow down and try not to hit the dots, then it goes into a slight uphill. We lost Tanya there, so then it was just me and Brooke. She preferred to sit on, which is slightly annoying but ok. I took some digs on the climbs, testing my legs and seeing if I could tire her out a little. I couldn't remember the last time I'd ridden 60 miles so I wasn't sure that trying to ride away was the best tactic. Then again, my sprint isn't legendary, but I took my chances. We cat and moused it in the last couple Ks leading to the finish, but once the line was in sight - and I heard Mr. Cameron Mitchell yell GOOOOOO - I unleashed my almighty burst of speed and took the win. Afterward, I told Tanya what happened, about how I'd really put down the watts with my blistering sprint, to which Todd added "said Amy never." Thanks honey, I love you too. The best-laid plans of mice and men...and Mike's Bikes women...well you know the rest. It's bike racing, and things change faster than you can say "gravel in a corner." We lined up with a strong squad ready to lay down some serious tactics and set ourselves up for a 1-2 podium at Berkeley Hills Road Race. This wasn't unrealistic considering we comprised almost half the field and have been on a roll this year. All I could think was "this is going to be fun!" What could be better than 70 miles of aggressive, hilly racing with Diana, Sara, Zanna and Mel? Our best-laid plans went awry early on, as a patch of gravel less than 10 miles in claimed various carbon bike parts and large swaths of skin from Mel, Zanna and Diana. Sara kindly stopped to assist with cleanup, and that left me (lucky and feeling the need to avenge the gravel) rolling on with the now seriously-reduced field, after a quick brake caliper fix. Almost everyone else was solo, and I knew attrition was going to be the name of the game from there on out, so my tactic was just to ramp up the pace over each climb to see who we could snap off. On such a windy day, no one was going to be able to re-attach. After 3 laps of this, I was left with Brooke and Eleanor, both of whom seemed pretty content rotating through until the last time up Mama Bear, when I went to the front again to wear them down a bit before the final climb. I felt good, and fairly confident in my uphill sprint, so figured that unless one of them decided to go early, I'd wait until I hit those finishing cones and then hard charge for the line. And that's how it went down. Both waited on me, I chose my spot and sprinted for the line to take it. The big lesson: bike racing is unpredictable and you often have to do a quick change of strategy. I would have much rather raced with my teammates but it was nice to get the win for them. Many thanks to the Berkeley Bicycle Club and all of the volunteers who put on this beautiful race. Also, the prizes were legit - I won some new wheels! Snelling has always been one of those races on my “hit list” - a classic NorCal course with power climbs, windy false flats and a kicker uphill finish. I’ve been lucky enough to be within the top spots for the past couple years, so I knew the course favored my punchy riding style. However, unlike past years, I didn’t really want to go into the race with an overly formal plan. Chatting casually in the parking with Amy, we had pretty general goals: be active, race hard, conserve when appropriate and be ready to set-up the sprint if it came down to it. 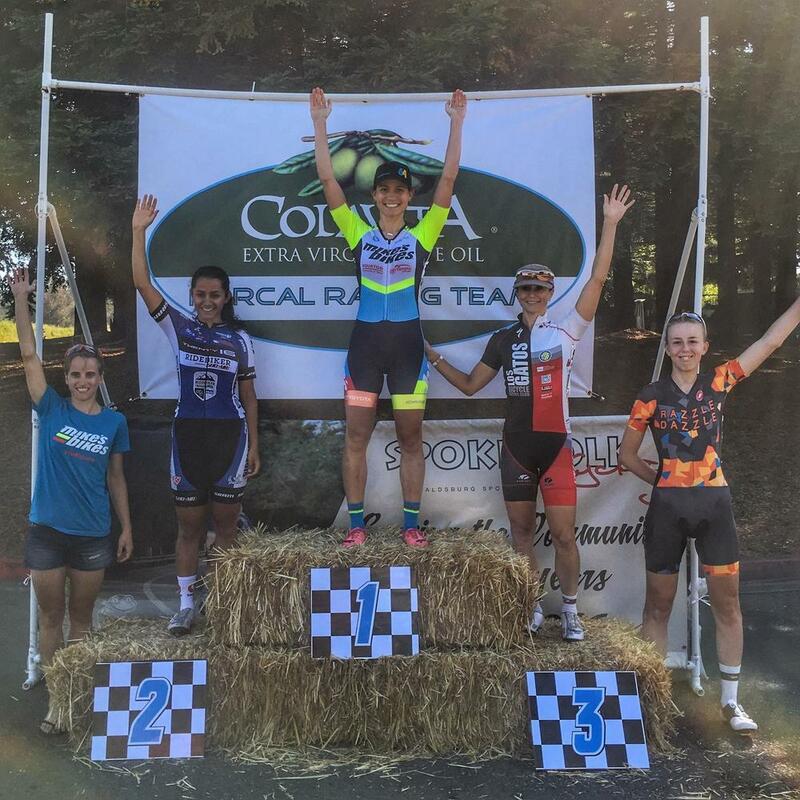 This year the small women’s field had two dominant teams (5 from JL Velo and 4 from Cyclesport Specialized) along with two strong unattached riders. On lap one Sarabeth Liebert (Cyclesport Specialized), rolled away from the field while JL was tempoing at the front. Since it was so early in the race, I wasn’t overly concerned with this escapee, but as the gap widened with no response from JL Velo I became more and more nervous. The Snelling course has many turns in it. Once a rider gets “out of sight, out of mind” it can be hard to bring them back. Halfway through lap 2, with Sarabeth 1 minute up the road, I started to put in small attacks to elevate the pace. Amy countered my attacks and Megan Ruble (Cyclesport Specialized) did the same to try and break away from the field. Bit by bit we pulled back Sarabeth and by the start of lap 3, the group was together, minus 3 JL Velo riders who were dropped. With the first signs of strain starting to show in the field, Amy threw down laps 3 and 4. When she wasn’t sharing the pacemaking with the Cyclesport Specialized riders, she was attacking the roller hills. All her hard work meant that I could sit in, recover and conserve as much energy as possible. I only countered or attacked when the composition of riders or the terrain made it particularly beneficial. By the end of lap 4 we had dropped two more riders from Cyclesport Specialized, and the remaining members of the field were preparing for the sprint. Heading into the final, long “L” stretch stretch before the finish, riders were jockeying for position. We knew I needed to be top 4 going into the final right hand turn, so Amy worked with Megan to keep the pace up, while I sat snugly 3rd wheel. In the final 200m before the turn, Eleanor Velez (Unattached) emerged from the left side of the group to pass Amy and be the first into the turn, taking the outside line. I jumped with her and used the inside line to my advantage to bridge up to her quickly. As I approached her rear wheel, I kicked hard and attacked through her then sprinted the rest of the way to the line. I can’t say thanks enough to Amy for her incredible amounts of work - it was truly a team effort that out-manned and out-gunned we were still able to pull off the win and finish with sweaty faces, sore muscles, and big smiles. I was particularly excited about this team camp, for a couple reasons. It was going to be in Santa Cruz, my hometown and best city for cycling (in the world?! ), our team roster boasted 11 of my favorite cycling friends, and the weather was going to be perfect. Friday night we all showed up at the host house with bikes spilling out of cars and hugs and chatter all around. Amy opened up the Equator box and handed around our Equator beanies and bags of fresh coffee. I handed out the team t-shirts and broke open the box of Gu product for the weekend. It was the ultimate cyclist partay. Even the two host house kittens made friends and cautiously investigated the noisy living room. Saturday dawned clear and COLD. After a huge breakfast by our own Melanie (oatmeal, and bacon and scrambled eggs, and baked cinnamon apples!!!) complete with the requisite Equator French presses, we went through the typical layers on and layers off and finally rolled down the hill into the redwood trees and backroads. Today’s ride was an iconic 55 mile Santa Cruz classic; Eureka Canyon. The loop did not disappoint. After warming up through the trees, and meandering out through town, we hit Corralitos and the base of Eureka with smiles and miles of snacks to go. Some people smashed up the hill, and some rode casually to take in the views, but by the time we rounded up at the top of Soquel-San Jose Rd, everyone had logged a decent leg beating at some point or another. Lunch was equally epic and dinner soon followed. We tried to go mini-golfing but the Boardwalk had rented the golf course out to a “private event”. Day 2 was intended to be a team day, with a flat route to facilitate rotating and team work. After our team picture in our beanies and tees, we took the scenic route past East Cliff, to take in the ocean breeze and views of Monterey, before heading to the flatlands of South County. Along San Andreas, we hammered out a team time trial, staggering two teams to add an element of racing. At the turn around point, it was time to head home, as the miles of smiles was taking a toll. Rolling back smoothly, we climbed the brutal 4 minute, 15% hill to the host house, and collapsed around the table for a late lunch. The first Grasshopper of the series, Old Caz is always a mighty wake-up call that the season of bikes has officially begun. This wake-up call isn't of the gentle iPhone alarm variety though. No, for me it's usually more like a punch in the gut or a bucket of cold water straight to the face. "AMY, it's time to get serious," it yells. "Pfft," I scoff, "notice my lack of fitness, these knobby tires I'm riding and this goofy grin on my face. Clearly serious isn't my plan. Plus, JANUARY." This year Jennifer, Sara and I joined 680 of our closest friends for the 20th anniversary of this "race," which always attracts some serious hitters on the men's and women's side. Sara was rocking her FS MTB, and asked about a Camelbak (her chill factor was sky high). Jen has a Stigmata that matches mine, but she probably rides it as much as I do. At least we all looked really good! Climb, descend (keep your mouth closed), group up with some others, climb, descend, shove in some food, climb, refill bottles, descend, slosh across the creek, climb, roll for a bit, climb, DONE. See, wasn't that easy? Well yes and no. I couldn't help but be awed by the gorgeous day we got to enjoy. The area around Occidental is just insanely beautiful and every time I'm up there I'm thankful we get to ride around like kids in such a great area. The race itself forces you to go into the red from the gun, right up the Coleman climb, so nothing about it is particularly easy. This was my first year riding my Santa Cruz Stigmata CC, though, and it definitely made a difference. Plus I've been riding dirt a little bit more than usual, so I was a *wee bit* faster downhill this year (don't laugh). Interested to hear what the Women’s team has in store for 2018? Looking for a new group to race with and friends that will challenge you on the road, on the dirt and gravel, and in races? If you're looking for a new team to ride for next season, consider contacting Samantha Vroomen of the Team Mike's Bikes p/b Equator's women’s squad. We're on the hunt for riders in the Cat 2's to riders who are 3's and ready to start working up the ranks. Why ride for us? Because we continue to improve while having fun. Most importantly, we strive to be a good influence for other women looking to join the sport and for racers looking for leadership in races. The entire Mike's Bikes team has found success through teamwork and a big reason for this is that teammates become like family and we're willing to rise to the challenges of racing in a strong NCNCA field. Feel free to chat us up if you see a women riding by in the 2017 Mikes Bikes kit. Or, contact us if you are interested to see what we are planning for 2018! The Golden State criterium and circuit race are always one of my favorite courses of the year! It was fun having my teammates Trish and Mei for the race, and I felt that we did a good job working together. About halfway through the race, a woman went off the front and developed a good 30-second gap from the field. Oftentimes I would attack and bridge the gap, but I thought two things. One, the group would probably not let me go and would chase me down because they have seen me break away before. Another thought was that maybe I should try not attacking at all during the race and see what happens. It was strange not attacking, because I’m often attacking and trying to bridge gaps. I sat in for the entire race, and at the end found my teammates and I on the last lap at the very front of the pack. Seeing that we were not in the best position, I jumped out from 3rd or 4th wheel and attacked before the 2nd to last turn. I lead out the pack into the last turn and ended up getting 6th place. For the circuit race there was Mei and I, and I decided again to watch the pack and see what I could do at the end, in support of the team result. On the second to last lap, I started moving up towards the front, and felt pretty good about my positioning. Just before the chicane, I was 3rd or 4th wheel and was pleased to have finally learned the timing for good positioning! When my team mate Mei came by me and told me to get on her wheel, I followed this move, but unfortunately, as we went through the chicane I ended up on the inside line and consequently got pinched by the curb and the pelotons’ line. I had to brake very hard to avoid hitting Mei’s wheel and the curb on the side, and due to this I lost all my momentum and got 6th place. Lucklily, the riders around me were alert and the corner braking did not cause a crash. I did learn more about navigating through the pack and how to place for a sprint finish. However, since I know that I’m not a sprinter, this race was a good reminder to focus on getting in a break away or coordinating a lead out for a teammate who has that finish line kick that can net us the win. Overall, I learned a lot that weekend and I will try to have more patience with my moves in the pack, and continue to learn more race tactics. I was exhausted when my alarm blasted through my dreams at 5 am that Sunday. The prior day had been spent helping out at Mike’s Bike’s Mega Sale and then racing in the brutally hot Cat’s Hill race. I was on a bit of a mission though; I had placed almost stone last at Cat’s Hill due to a mixture of heat, delayed start, and poor timing on my hard efforts. I really wanted to redeem myself. After begrudgingly going through the morning routine and flopping into the car, we drove over to Livermore. It was surprisingly chilly that morning, and I warmed up by turning on the seat warmer and watching the competition roll around through the window. When we lined up and the whistle blew there was a small group of us, but one notably strong pro rider. The race odds went from “possible win” to “this is going to be a sufferfest” once I noted that addition to our start list. The first hill was decent, but it got harder, and harder, and finally I was climbing fully out of the saddle and breathing like a dinosaur. Thank goodness we crested the hill and turned over the overpass just as I registered that my legs were screaming. We’d already lost two people. We got to the next rollers and the pro rider rolled to the front. She looked over her shoulder and then just started kicking out watts like she’s just been warming up over the first hill. Only 3 people made it over the rollers with her, and I was not one of them. I looked down at my garmin to vaguely register that we were 20 minutes into a 3.5 hour race, and the field had just shattered into the final selection. This was definitely a sufferfest. I caught a rider and we both got caught by another. That makes four up the road and three in the chase with some stragglers deciding whether to keep chasing or to throw in the towel for the day. By this point it was also in the high 80s. Aka quite warm. Things were pretty boring for the next few hours/laps. I even got to enjoy the snake carcass we kept passing, and caught glimpses of the infamous windmills that dot the horizon throughout Livermore. This place would be quite gorgeous if I didn’t happen to strongly dislike getting dropped on hills in dry heat with only two waterbottles and no flat kit. The last lap I spent the majority of the time trying to figure out how I was going to win the “field sprint”…out of the three person groupetto that we’d become. Was it worth sprinting for 5th? Yes. Was it going to hurt? Yes. How long should I anticipate having to sprint? 2 mins max up a fairly steep hill. Did they have water at the finish? Hopefully. Were we last on the course for the morning wave? Yes. We hit the rollers. Folsom, who had two team mates up the road and had done an excellent job of doing nothing to help us catch the selection, attacked up the hill, drilling the pace to make sure I didn’t attack her into the descent like the last lap. She was pooped by the flats though and I took a pull, constantly glancing back in anticipation of the attack. Finally I rolled off the front to see if anyone else would pull as we got to the last right hand turn. Only 4 minutes left!!! JLVelo thankfully took the front and I slotted in at third. At the base of the hill, Folsom attacked again and I followed, JLVelo dropping back with a leg cramp. Half way up and I knew I’d have to go soon but not too soon as the finish line was jauntily placed on the flattish descent after cresting the hill. When I could see the line I attacked with everything I had (not much at that point) and pretended it was a crit finish. Wheezing like a stuck train, I sweated and grimaced and groaned past Folsom for a 5th place finish. What a long ride. There were seven of us. As the climbing started two popped off. A few miles up ahead there were rollers and another popped off. So, down to 4. One of the ladies with us was not really working, likely in an effort to save her legs for the later laps and because there were a couple of her team mates in the selection with us as well. The other three of us in the selection were doing more of the work, so it was kind of obvious who the main team was working for. Anyways, first lap went well. Second lap, two women were attacking on the climb, and I was behind another rider who let a gap open. Burned a match trying to catch the attacks after the gap opend up...and one match definitely became many matches. I never caught them, they kept getting further and further away until I couldn't see them anymore. I pretty much dragged the others around for most of the second lap. I was desperately trying to drop the other rider, since she wasn’t working while her team mate was up the road, but I was so exhausted! I even slowed down to about 10 mph to see if she would come around. It was kinda funny, she wouldn't come around. The third lap came along with the climb and I popped! She took off. I was so close to quitting that that turning around went through my head at least 4 times. But I held on and finished. I'm so glad I did, as I got 5th and an epic lesson in bumpy road riding, steep climbs and descents, and how to tactically ride when team mates are up the road. Cal Aggie Criterium, held on the same course as the Land Park Criterium, is a flat, 1 mile closed loop, that includes a hairpin turn and a couple of chicanes. Earlier on in my racing career, I was nervous about criteriums--especially the technical ones like Cal Aggie. Over time, I learned that technical courses can actually be safer--and certainly more interesting--than 4-corner races. With this being my first criterium of the year, my goal was to focus on skills and placement. I also wanted to launch a couple of attacks to test my early season fitness. I had W3 teammate Trish Pablo with me in the Category 3/4/5 field of 19 racers, and Makenzie Delaugher on the sidelines for pre- and during-race support. I was successful in my goals of racing actively and staying towards the front of the pack, especially heading into the hairpin turn--the spot on the course where riders in the back have to work extra each lap to make up time lost to the accordion effect. Trish and I took turns attacking, and she was even able to stay away for a bit while I covered from within the peloton. Halfway through the race, we were starting to get tired and agreed to race a bit more defensively in order to recover before the finish. I knew that placement heading into the technical side of the course would be critical on the last lap. I made efforts to move up, but was still a bit further back in the pack than I wanted to be as we headed through the chicanes and out of the last turn. Nevertheless, I managed to dig deep and move up through the final stretch for a 3rd place finish! I’ve heard of a superstition that what you do on New Year’s Day sets the tone for what you’ll be doing all year. If that’s the case, what better way to start 2017 than with a bike race? San Bruno Mountain Hill Climb, a mass start race for 3.6 miles and around 1,160 feet up San Bruno Mountain, kicks off the NCNCA racing calendar each January 1st. Top contenders in a hill climb race need the right mix of watts per kilogram, aerodynamics, and raw power, so I was super happy to have teammate and accomplished time trialist, Trish Pablo with me in the 3/4/5 field. The race started in a combined group of 17 Category 3/4/5 women and 4 Category 1/2 women. The pace was pretty high right from the whistle, and Trish and I made sure to get towards the front. We settled into 4th and 5th wheel, and kept track of who was around and in front of us. We rode with the Category 1/2 women for a while, but with only a couple of them up front in competition with each other, we soon let them have their own race (since they’d be scored separately from us and in order to preserve our own energy). That left Trish, me, and a W3 competitor from Team Swift climbing together. Midway through the ascent there is a quick loop-de-loop descent through a parking lot and under a bridge. Racers sometimes lose time here by making the mistake of easing up for relief. Since I had pre-ridden the course and knew what lines to take to keep pace through this section, I got on the front with Trish following on my wheel. We made it through the section, but hadn’t managed to drop Team Swift just yet. We returned to climbing, and started preparing ourselves to duke this out. But then, as the grade got steeper, we heard our competitor starting to breathe just a bit heavier than we were. This was a good sign! Trish and I continued on and she started to fade. The gap between us and Team Swift grew, and we got more and more excited--now Trish and I just had to finish this thing off! We kept our effort up the last of the climb and finished 1st and 2nd! Looks like 2017 is going to be a good year. 2016 Watsonville Criterium for the (almost) win! Hope everyone had a good weekend of good stuff and sunshine! I finely have my legs back and am trying to get myself ready for San Rafael. Essentially, some crit action was in order between now and the Big Race. I made it down to Watsonville for what turned out to be a fairly technical crit with 6 corners, a few of which had dipped gutters running across the street just before the corner. A few of those corners had gritty pavement as well, plus there was a sharp < 90 degree turn, and a little bump to the finish. It was a small field of 8 - 4 JL Velo, 2 Cyclesport, and a couple freelancers. I felt like I had a shot at a podium. I also was feeling pretty good and therefore antsy. I attacked at the start of lap 3, got a good gap, but it all came back together by start of the 4th lap at which point I rolled over something and flatted spectacularly. Didn't have a wheel and no one seemed to want to lend one, but at the last minute I had a loaner and was back in! Some moves were attempted and turned out later there were a few primes. I noticed some folks were attacking on the "climb" but then sitting up so I tried countering and attacking over the top and down the other side, especially since the next 2 turns were tough for me and thought I could take them better if I was in the front rather than the back. No one was getting away though and by 10 min in, our front group was down to 5. I thought it might be wise to conserve and follow things for a bit. I tried again with 4 to go hoping maybe someone would join - got a good gap but again, went nowhere. JLVelo countered my move and was out there by herself, but Laurel brought down her gap, and on the last lap or so SVCS made a move and got a gap on the (reduced) field. The lone JLVelo was losing steam, SVCS was holding her lead in no man’s land, and Laurel was tired from her effort in closing the gap, etc. I jumped and passed JLVelo after the last corner but could not catch Sara (SVCS) and came in for 2nd, with Tiina hot on my tail. This is my first time as a cat 2 on the "real" podium in a non-masters field so even though small field and no big guns showed, it was exciting and a good confidence booster! I purposely used to avoid crits - seeing as the first crit I raced I was crashed out in the final corner, less than 200m from the finish. But fast forward a year and a half and I've fallen in love with the fast-paced, anything can and will happen arena that is criterium racing. I'm still slightly terrified when I roll to the line, but especially after this weekend with my stellar teammates by my side, I'm not shying away from any crits any time soon. Sam and Elise talked me in to racing Colavita GP looking at it as a warm-up for our team race at San Rafael in two weeks. It was close to home, and an afternoon race (sleeping in day of bike race - unheard of!) so I decided I had nothing to lose going to "play bicycle" with these two. Sam and I had raced the Martinez crit about three weeks before and had a blast, so I knew I was in for a fun day no matter what. The course was windy, which thankfully kept the heat down, and while the race was in the opposite direction, we had practiced some racing tactics on the course earlier in the year during our team camp, so I was at least comfortable on the course. We had about 20 women in the field - including several strong sprinters and crit racers so I knew it was going to be a fun and interesting race! We had a good pre-race chat - discussing strategy and goals. We wanted to animate the race, cover attacks and put someone on the podium. Elise mentioned that it could work to our advantage to start the final sprint earlier than expected (tuck that nugget away for later!!). We all agreed though - that whoever was feeling good should go for it. The race started and Elise immediately got in a break with about 5 others. This was helpful for Sam and I as it meant we wouldn't have to work to close the gap. After a few laps of it all back together, I put in an effort to get a prime and ended up in a small break for about a lap with two others - but we got reeled back in pretty quickly. Sam did some solid work at the front, keeping the pace up and going with some attacks as people tried to bridge to various breaks. Things got really interesting when we came around a corner and there was a car in the middle of the course. Granted we had been warned that this was a possibility - no one actually expected this to happen. Thankfully the race volunteers kept the car from moving until we passed and everyone was able to safely swerve around it. At 3 to go, I took another flyer to push the pace since despite it being windy - the pack was still together for the most part. Realizing it wasn't going to stick, I fell back into the pack and Sam reminded me to get out of the wind, which was super helpful - I'm also learning what "crit brain" is and am very guilty of totally spacing out from time to time especially after an effort. I floated to the back, grabbed a quick drink and then started to move back up. With 2 to go, we were all together and things felt super jumpy. My primary focus now turned toward self-preservation as I got a little nervous when the pack started to get bunched up in anticipation. Starting the final lap the pace increased until we hit the back straightaway - I don't know if it was the cross-wind or what, but there was a momentary lull in the action so I saw an opportunity, took it and jumped. Thinking back - it was a fairly risky move to go so early, but it paid off! I put my head down with "don't you dare look back" going on repeat in my head and took the win! Emotional mash-up of stoke and shock for sure. Sam followed my move and came through 4th with Elise in 9th - great to have all of us finish top-10! This was my first time doing this race, and I really liked all the turns it had in it. In the beginning of the race, a woman went for a prime and got it. She created a gap and held it for a bit. I decided that right as she gets back to the group, I’m going to counterattack. When she just reached the front of the pack, I attacked. Nobody went with me, and it was really early in the race. The lap cards weren’t up yet so I thought that the pack would catch me eventually. I looked behind myself and realized I had a pretty good gap, so I thought okay I’ll just keep going! Some time later, I looked at the lap cards and they weren’t up yet, so I thought okay I’ve really got to stop looking at those because that’s discouraging. Sometime later I saw that the lap cards finally said 8, and I thought oh my goodness okay don’t look at those and just keep pushing. I kept telling myself to breath, get comfortable, and stay calm. I had to remind myself to drink water because it was very hot that day, and relax because I was tensing up. During a lap, I looked behind myself and saw a woman who was bridging from the main pack, and that made me push even harder. Eventually I didn’t see her anymore and kept on going. Then I saw that the lap cards said 3, and I thought wait can I do this? I looked behind myself and didn’t see the pack, and I thought okay only a few laps to go…KEEP GOING. Then I saw that there was 1 lap to go, and I got butterflies in my stomach. I was in the final stretch of the finish and thought no way, wait is this happening? I crossed the line and I couldn’t stop smiling. It was more like a smile of happiness and suffering because I was really exhausted at that point. It was so awesome to hear my mom and twin brother cheering me on throughout the race, and overall it was a lot of fun! For the Folsom Crit, I first raced the Women 3/4 field. In the first lap there was a prime, I went for it and got it. It created a gap so I kept going, and a moment later another woman from the pack bridged and got on my wheel. We worked together until the pack caught us. Then for the finish, I put in a hard seated effort just before the last turn and went in front of the pack. I then started to sprint, a woman went around me for 1st and I got 2nd place. Then I did the Women P/1/2/3 field for the first time! In the beginning of the race, a group of 3 women made a break and were out of sight. I was in the pack and just decided to go for it and attacked. I was by myself bridging the gap that was made. I wasn’t sure how far they were but just kept pushing. Once I saw the lead group and was finally reaching them, one woman started falling off the group. I was tired from bridging and started working with her. I wanted to get back on the lead group but didn't have much energy left to do so. The 2 women in the lead group got away. As a result, we became the chase group, and we were chasing for a while. After a good amount of time, several other women caught our chase group. Eventually the entire pack came back together. I tried attacking again on the backstretch on the last lap to see who would go but nothing happened. Before the last turn, I was looking around for my teammate Audrey for her to get on my wheel. Once she did, I got to the front of the pack and put in a hard effort around the turn final stretch to lead her out. I was so exhausted, but it was a fun day of racing! A trip to Fresno to visit family was in order for Memorial Day, so why not combine it with a few races? I set off solo at the break of dawn on Saturday to race the Granville Homes Circuit Race and Ventana Wall Hill Climb TT, followed by the Budweiser Sequoia Crit on Sunday. It promised to be a hot weekend of fun and a convenient excuse for missing Hamilton! 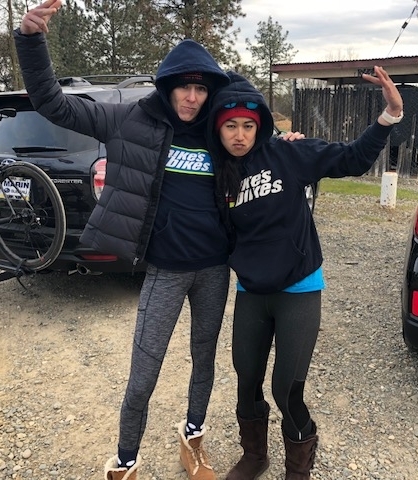 There was a small field for the 50-min circuit race - which did laps around a gated community and included a hill and a kicker - and I was pretty sure it would come down to some combo of me and the strong Folsom duo of Melanie and Judy. On the third lap it was time to make something happen, so I attacked hard up the short climb and immediately had a gap. I saw Judy coming along, and then Felicia from Pinnacle, but no Melanie. Good, I didn't want a 2 on 1 situation with both Folsom women. Judy and I worked together for the next many laps, eventually dropping Felicia. On the last lap I put in several digs but Judy stuck to my wheel. My tactical error was allowing her to play me and sprint around me at the finish. The Ventana Wall TT was a short one, just 2k, with the whole first km a rolling lead-in. Feeling fresh with my sports bra packed with ice, it was a quick 4:30 effort for the win. Sunday afternoon saw temps in the mid-90s and that familiar feeling of a Valley summer. Hey, I grew up in this, it's in my bones! The crit was 60 mins and I went through my 2 bottles and was still wishing for more. About 15 mins in, I got in a 4-woman break. We lapped the field and then sat in with the group (mistake!) and then looked at each other for lots of laps and did a field sprint. That situation isn't ideal for me; I ended up 4th on the day and 2nd overall in the omnium, with a good chunk of change in my pocket and a lot of lessons learned.